A Container - Lamp: the technique of thermoforming commonly used to make a container that once opened its rejected as trash, now is the final product: the container and content at the same time. Blightster is a thermoformed lampshade that by simply attaching the electric connector found inside (does not require electrical installation), its transformed to a beautiful lighting piece, that may be used as a ceiling lamp as well as a table top one. 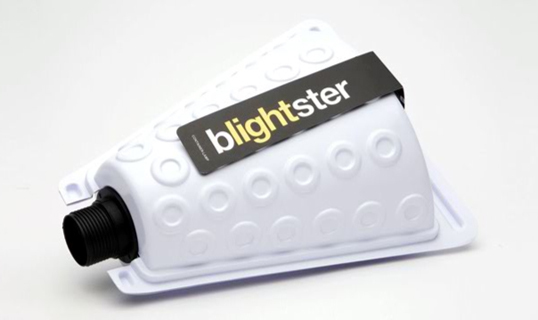 Blightsterlamp is a product which incorporates the product packaging in the final design of the product, reducing waste to a minimum - and still looking cool to boot. A simple technique that converts this piece into a low cost decorative object. The material used is thermoformed 500 microns stiff PVC.